In the first part of this article you will find information about towing ratings including GVW, GVWR, GCWR, Tow Ratings as well as practical notes regarding safety and legal consequences of overloading and surpassing these limits. Tongue weight (also known as Ball Weight) is the downward load applied by the trailer on the hitch ball of the towing vehicle. Usually, it is assumed that it represents about 10% to 15% of the trailer’s weight (GTW), although it greatly depends on the distribution of the payload in the trailer as well as trailer’s axle position. 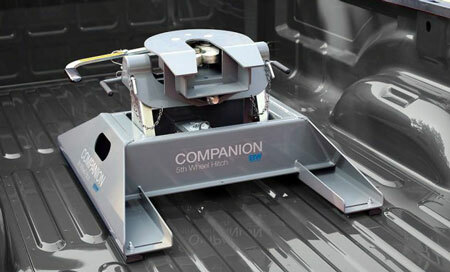 The TW is an important parameter because it adds to the weight (GVW) of the tow vehicle. It should be noted, that due to the location of the tow bar, this load is almost entirely applied on the rear axle of the towing vehicle. Be Educated! Do not follow this example :-) ! King-Pin Weight (also known as Pin Weight) is the downward load applied by the 5th wheel trailer on the hitch of the pickup truck. Typically, it is assumed that the load approximately represents 15%-to-25% of the 5th wheel weight (GTW). As in the case of the Tongue Weight, this load adds to the GVW of the towing vehicle (pickup truck). Due to the fact that in general fifth wheels belong to the class of large and heavy trailers, it is important to make sure that this extra added load does not overload the towing car (especially, its rear axle). You must make sure that the tow vehicle can handle an increased downward load. In other words, its increased GVW must be lower than the GVWR limit, its increased RGAW (Rear Gross Axle Weight) must be lower than the RGAWR limit and that the corresponding hitch is adequately rated for the given load. Both values - Tongue and King-Pin Weights (also called Hitch Weights) are usually specified by RV manufacturers, however these are rather approximations and apply only to unloaded trailers with specified Dry Weight (DW). In reality, most trailers are heavily loaded not only by optional equipment but also by all kind of camping gear, food, cloths, full water, propane and fuel tanks etc. Typically, we just guess the values of the Tongue and King-Pin weights (if at all we pay attention to these parameters). It may be worth to mention that there are tongue couplings equipped with the scale built right into the mount (Weight Safe Ball Mount). They provide convenient way to measure the actual value of the Tongue Weight (TW). However, in most cases (especially for King-Pin hitch) the ultimate answer is to measure the actual hitch weights at the commercial scale. Uneven payload distribution across the trailer may lead to too small value of the TW or even result in its negative value (pulling up the hitch ball). This may lead to instability of the towing vehicle and loss of control on the road! That is why trailer’s payload should never be arranged behind the trailer’s axle in an attempt to minimize the coupling (ball) load. 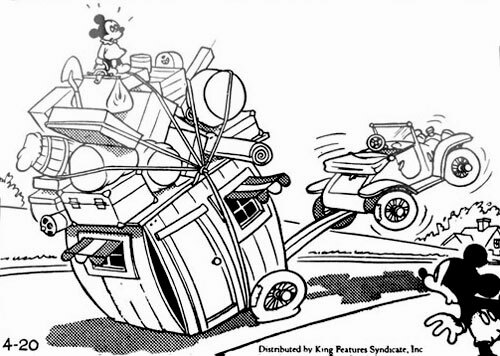 Too heavy hitch load may affect tow vehicle’s steering, breaking (in general its handling) as well as damage its rear suspension and tires. Above: Installed 5th Wheel hitch on the pickup bed. Below: Gooseneck hitch installed on the pickup bed. Gross Axle Weight is the measure of the weight applied on a particular axle. In the case of family cars, usually the values of the front (FGAW) and the rear (RGAW) axle weights can be approximated as half of the vehicle’s actual GVW value. However, it is not the case of trucks (including pick-up trucks), because they are designed to carry substantial load on their beds. Vehicles’ axles (including trailers) have specified load capacity that should not be surpassed. Usually, these limits (ratings) are quite generous, so they are rarely disclosed by manufacturers of family cars and smaller trailers. In these cases, the load limit for an axle can be determined based on the GVWR and correspondingly GTWR. The maximum weight that can be supported by a vehicle axle (GAWR) must be specified for pick-up trucks (as the matter of fact for any utility vehicle capable of carrying the load over the rear axle). Usually, in such cases the real axle rating (RGAWR) is critical because the payload and/or king-pin weight is applied on the rear part of the truck. The front axle limit (FGAWR) is rather determined by vehicle’s design as well as weight of driver and front-seat passenger. Under normal circumstances the weight of the payload carried on the truck’s bed is only marginally transferred onto the front axle. That is why, before committing to any fifth wheel trailer you have to make sure that your truck’s rear axle has adequate rating (RGAWR). Please note, that this limit is actually determined by the lowest of axle, wheel or tire. Assuming well-balanced vehicle, you can determine the load of each tire by dividing the corresponding GAW by the number of tires (or the GAW by the number of axles and then number of tires in each axle). Tires may be at risk especially when you replaced the original ones (factory-mounted) with the new tires of possibly lower rating. To be on the safe side when pulling large and heavy 5th wheel trailer it is suggested to use pickup trucks with a double-wheels rear axle. The French equivalent of the GAWR is known as PNBE (Poids Nominal Brut sur Essieu). As the name suggests, the Dry Weight (in some countries called Tare Mass) is the weight of a vehicle without any consumables (like fuel, water etc..) and payload (passengers and cargo). The Dry Weight is determined by the manufacturer and is stamped on the factory label (driver’s doors frame). This definition applies to powered vehicles (cars, trucks) and to trailers. Usually the DW represents the standard factory configuration. Any permanent option installed once the vehicle left the factory doors will increase vehicle’s dry weight, although this fact will not be reflected on the corresponding label. In the case of family cars (sedan, SUV, minivan etc) the dry weight is rarely altered by vehicle’s owner. Cars are delivered with nominal levels of all necessary oils (engine, transmission, servo, brakes etc ), fluids (cooling) and minimum level of fuel. While some may argue that these are “consumable”, the truth is that without these oils and cooling fluid, cars cannot leave the factory, so they are “inseparable” parts of the car (and its weight). Most options and “gadgets” selected at the dealer have negligible impact on the family car’s weight. 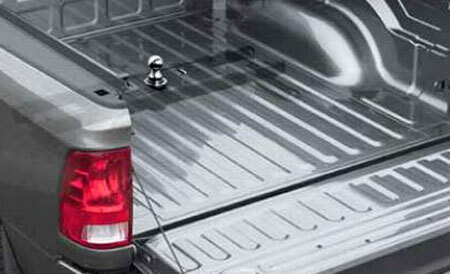 Exception may be only the tow bar (the roof rack is usually considered as “removable” so it will belong to the cargo). Trailers are totally different story, because usually they are offered with countless options and some of them may be quite heavy. You have to be aware, that installed options may (and certainly will) significantly decrease trailer’s allowable payload. Sometimes, manufacturers specify the Unloaded Vehicle Weight (UVW). The UVW is defined the similar way as the Dry Weight so they are pretty much equivalent. Some manufacturers weight each unit at the final inspection stage to provide an exact value of its Dry Weight DW (or UVW). Curb weight represents the weight of the vehicle with all consumables but without the payload. For cars the extra load consists of full tank of fuel (gas or diesel) and full windshield sprinkler. For trailers the extra load includes full water tanks, full LPG bottle(s), batteries, fuel for generator (if any) and (although some may not agree) all permanently installed optional equipment. It will be for example awning, A/C unit, heater, extra cabinets, solar system, roof rack, ladder (if any), spare (if not part of the standard configuration) etc…. This definition is implied by the fact that the Curb Weight corresponds to the weight of the vehicle parked at the curb side of the street (so “as it is” before loading it with the payload). The Curb Weight is an important number, because vehicle’s allowable payload is calculated as: GVWR – CW. To make it clear, for cars the payload includes driver, passengers, cargo and hitch weight (if towing the trailer). For trailers, the payload includes all extra stuff you want to take for the vacations (eventually minus the hitch weight). Given the fact that for trailers, the factory specified dry weight (and so Curb Weight) is usually significantly altered by installed options, it is strongly suggested to make a “once in the life” trip to the closest commercial scale, then measure and write down the actual value of trailer’s Dry Weight (Actual DW) or even better, the actual value of the Curb Weight (ACW)! You will need it to figure out the allowable payload. For cars, payload includes the weight of the driver, passengers and cargo as well the hitch weight (if towing the trailer). For trailers, the payload represents only cargo (although its allowable value can be increased by the amount representing the hitch weight). If you do not take into account the hitch weight, you will build some extra “safety” margin for trailers, but you will lose a substantial amount of allowable cargo for fifth wheels. Remember: Hitch weight adds to the payload of the towing vehicle (so decreases the limit for cargo), for trailers it subtracts from the payload (so increases the allowable limit for cargo). For the practical reasons, let’s focus on the Cargo Weight for trailers. Cargo includes all you will pack into the trailer before hitting the road. It will include your cloths, linens, books, dishes and utensils, kitchen stuff, food, cleaning supplies, electronics, camping gear, bicycle(s), water sport gear (canoes) and the list can go on because only sky and imagination set the limit…. Basically, it is all portable/detachable/removable stuff you want to take with you. For obvious reasons you have to make sure that the sum of Curb Weight and Cargo does not surpass any relevant ratings (like GVWR, GTWR, GAWR, Hitch rating ….). Note that the Payload is a Weight Rating (in other words it is the limit that cannot be surpassed). It represents the maximum weight that persons and cargo (for towing vehicles) and cargo (for trailers) should never exceed. The name is a bit misleading because today’s bumpers by no means can support such load. It rather represents the fact, that these type of hitches is installed next to the bumper. Note that tow bars must have label plates indicating their crucial parameters: maximum towing weight, maximum ball load as well as the model of vehicle for which the bar is designed. 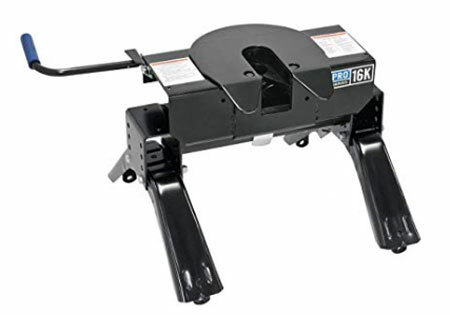 As the name suggest, this hitch is designed specifically for fifth-wheel trailers. It is a large plate in the form of a horseshoe designed for mounting on the bed of the pick-up truck. It is known as a King-pin Hitch. This type of coupling offers much better stability and handling on the road (important factor given the fact, that fifth wheels belong to the category of large and heavy trailers). 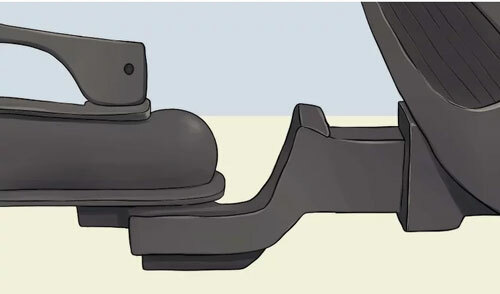 Gooseneck hitch similarly as the fifth-wheel one consists of the horseshoe-shaped plate installed on the bed of the pickup truck. 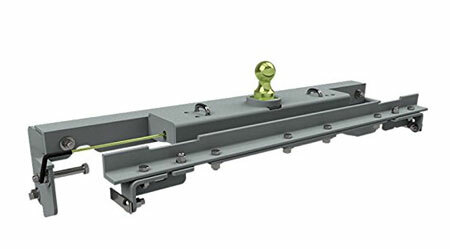 However, instead of the king-pin coupling it uses a ball and a coupler just like the bumper hitches. Gooseneck hitches are preferred for heavy trailers due to increased stability on the road. They are quite popular solutions for horse trailers.